We have done specification comparison review and high ISO test of all the best APS-C DSLR and mirrorless camera available in the market today, take a look at the specification comparison table below..
Out of all these Prime machines Samsung NX1 core specification grabbed the maximum green lights, in terms of resolution, Advance AF system, ultra fast continuous shooting speed and a option to record 4K videos .. so finally we have to believe that Samsung NX1 camera has outstanding core specification. Resolution – The Samsung is the only one who can produce gigantic image files of 28 MP by having a APS-C sensor, A 28.2MP BSI APS-C CMOS Sensor combines with DRIMe V Image Signal Processor works to produce ultra high-resolution image from a APS-C Sensor. ISO Range – The Nikon D7200 features the broadest ISO range (100-102400) out of all those 4 cameras, the other most important factor is the Nikon D7200 doesn’t have optical low pass filter… so due to these two major advantage we do believe that it will going to produce better image quality (less noise and more details during low-light condition) compared to the other competitors. Optical Low-pass filter – The absence optical low pass filter ensures the sharpness of image when viewed at 100%, so you get more details in Fujifilm X-T1 and Nikon D7200 when viewed at 100%. Image Stabilization – The Sony A77 II is the only camera that features built in image stabilization system, the camera will sure help you to bring out sharp images during low-light environment. 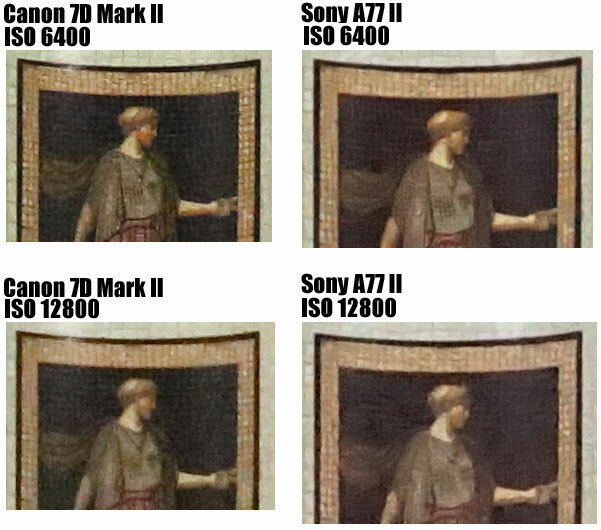 Both Nikon D7200 vs Sony A77 II features traditional Contrast detect CMOS sensor and a separate AF module below the sensor, So the phase detect AF Module (with 51 AF points) of Nikon D7200 works only when the photographer is using the viewfinder of the camera, on the other hand the Sony A77 II features fixed SLT mirror so the Phase AF sensor below the sensor is always active while using viewfinder or display screen. The A77 II AF module features 79 AF point which incorporates 15 centrally-located cross-type points. 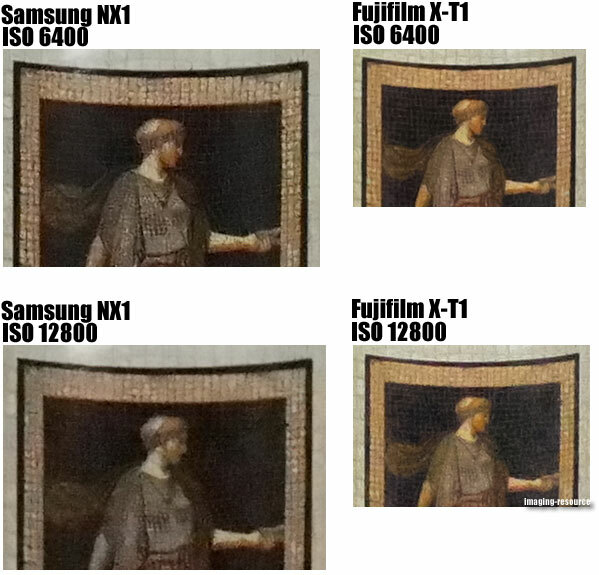 Samsung NX1 and Fuji X-T1 features Hybrid AF sensor with built-in active phase AF pixels inside it, so there is no separate AF module present in both the camera, the Samsung NX1 28 MP Sensor also features 205 phase and 209 contrast-detection autofocus points to acquire focus quickly and precisely and on the other hand we don’t know much details about the details of X-T1 AF system. Canon 7D Mark II features Dual Pixel CMOS AF Sensor and it is one of the most advance technology for Auto-focusing used by any camera till date, the camera uses the 65-point all cross-type autofocus system while you are using viewfinder and it activates Dual-Pixel CMOS AF technology while you are using live-view screen .As we know that in Dualpixel CMOS AF tech the system composed of two separate photodiodes within each pixel to provide a broad and dense network of phase-detection gathering elements across nearly 80% of the frame, the AF system is always utilized while you are using live view display screen for shooting video or stills. (click here to see how dual pixel CMOS AF work). Continuous Shooting Speed: We don’t know what kind of alien technology Samsung has, but the Samsung NX1 can shoot 15 frames per second @28 MP, no camera stands in front of Samsung NX1. Video – Only Samsung NX1 can shoot 4K videos by having Full Time AF support with the help of Hybrid CMOS sensor, all the other camera limited to Full HD recording only. Nikon D7200 Image sample isn’t available yet, but we do have High ISO test images of Canon 7D Mark II, Sony A77 II, Samsung NX1 and Fujifilm X-T1. Canon 7D Mark II and Fujifilm X-T1, both the camera showing impressive image quality during high ISO test, the at ISO 6400 and 12800 image have minimal amount of noise and more details compared to Sony A77 II and Samsung NX1. Samsung NX 1 is clear winner if we look at the comparison table of both the camera, but the NX1 system have very limited number of lenses available… so if your lens requirement is limited you should go with NX1. Canon 7D Mark II is looking bit weak in comparison table but the Dual-Pixel AF system and Image quality of the camera is really impressive, the other major factor that make you choose Canon 7D Mk II is Canon professional Lenses available of the 7D Mk II DSLR..
Nikon D7200 AF system is out-of date, Nikon should add Hybrid AF sensor to all its upcoming DSLR to compete in the current market. Sony A77 II look good on paper but the image quality is not so good, above all the images of Sony A77 II have reddish tint on them. Fujifilm X-T1 is one of the best mirrorless camera I have ever seen, the camera features advance X-Trans II sensor, no optical low-pass filter and Hybrid AF system, despite of its bit low resolution.. the image quality is good at High ISO range. Final Word: If you are planning to buy a Pro APS-C DSLR, you should go for Canon 7D Mark II DSLR. With the latest firmware update released a few months ago, the X-T1 is capable of 1/32,000 shutter speed. I don’t understand how the Pentax K-3 doesn’t appear on this list. Although it is a late 2013 model uses the same sensor as the Nikon D7200 and is clearly an excellent High – End APS-C and is still in production. The highest shutter speed for the Fuji X-T1 is 1/32,000 as of December 2014 firmware release (electronic only). on continiuse speed, nikon D7200 has the lowest rate at 6 fps not fuji X-T1 at 8 fps. also noticed you have not made any corrections on your chart after you have receive few other corrections past few mounth. is there any problem!!!!!! My staff member are bit lazy … I will update this today…. – Have a quite high versatility.